Is your D-pad not measuring up? There have been all manner of unusual peripherals on Nintendo consoles. The Hyper Boy is the first that springs to mind, but the 3DS hasn't had as much attention lavished on it from the realm of the peculiar and cumbersome – until now. 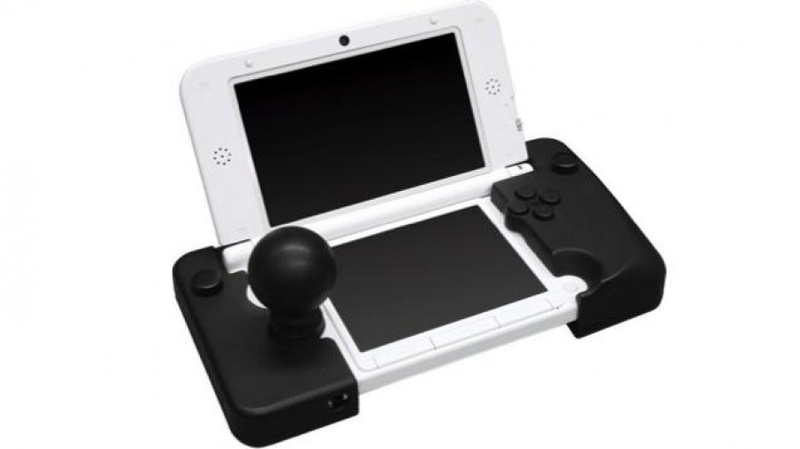 Introducing the Cyber Arcade Stick for the 3DS XL – an enormous grip for the sides of your device that allow you to manoeuvre your D-pad with a joystick slapped on top. This is not an entirely new concept, and has been done a dozen or more times with the original Game Boy, but has modern technology progressed far enough to make it more comfortable than a colonoscopy? We may well find out when it's released. If Super Smash Bros. for Nintendo 3DS allows using the D-pad for movement, this may be just the thing certain gamers will want, but given that such a control method is mere speculation it would be wise to wait until more details have been made public. This monstrosity is soon to be released in Japan for just a hair over ¥3,000 (roughly £18), with no word on a release outside the region. Would you consider importing this product or do you consider it just another cleverly-shaped lump of plastic? Why not for the circle pad instead? I feel like alot of peripherals like these will come out for Smash 4. The + Control Pad is for taunts. Have fun choosing which warmup stretch Wii Fit Trainer does with a fancy new joystick. @JSaario yeah, i think even Nintendo will make some. I would be happy if we got something like this for the circle pad that makes it a normal control stick (like the one on the pro controller, nunchuck and GC controller) and give the 3ds a good grip. I would so buy it. Why not put some bandaids on your fingers and maybe someone else's prescription glasses on while you're at it - can they simulate some crying kids in the background? Seriously - when they put buttons over the actual buttons - have they ever played a video game? The most important aspect of getting good at a game is getting in tune with the controller - and putting buttons over buttons just makes the control experience TERRIBLE. OK Coffee Has Kicked In. And here I thought that Monster Hunter Circle Pad attachment was a weird accessory until this shows up at the scene. @vitalemrecords ya just answered your own question theyll get in tune what what they added onto the experience. Guess this one is better then the Monster Hunter one? Wow, when I first heard of the 3DS, that was pretty much what I expected to see, except no circle pad and this was the only control on the left side. And the joystick folded into the system. Everyone is missing the point... this is clearly for Street Fighter style classic arcade fighting games, not Smash! Why couldn't they make it work like a circle pad pro? The weirdest thing is that in the photo he's using a wineglass grip and that just seems dangerous with the top screen right there. Looks decent for Super Street Fighter 4 3D. As far as I'm aware the only game on the 3DS that players would prefer a stick on is Street Fighter 4, which is woefully outdated at this point on the 3DS. @PvtOttobot That is exactly what I thought. But why now of all times. Anybody know an EU supplier of Cyber stuff. 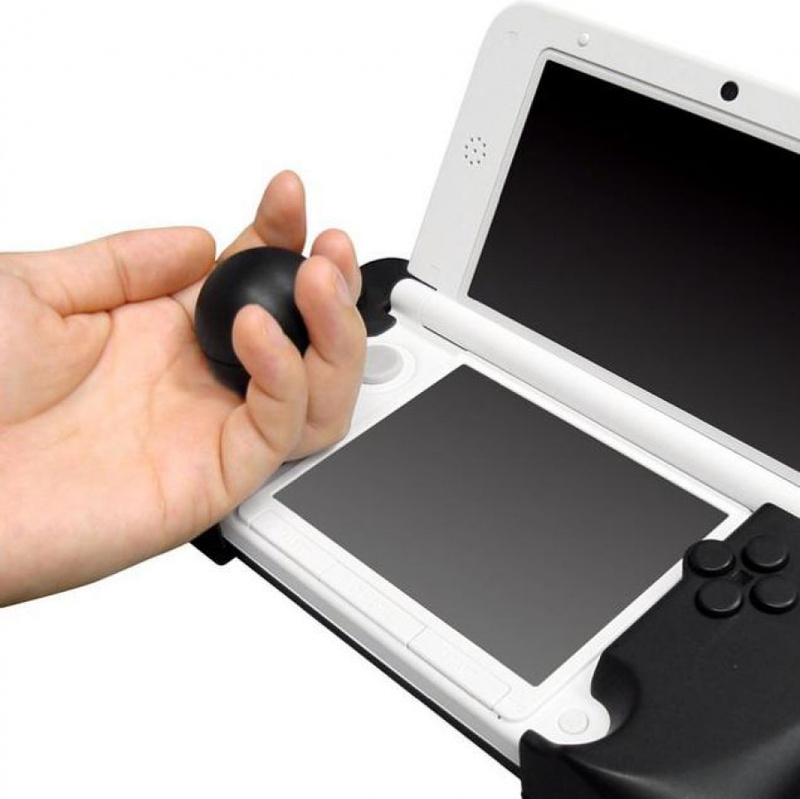 I want the rubber grip they make for the 3DS LL. (Without doubling its price due to import duty). this would be cool for Street Fighter IV if they could get all the buttons on the right hand side like a real fighter stick. Ehh. I wasn't optimistic about that stick-on analog thing NL pointed out would be useful for Momster Hunter, but this... Just no. It looks RIDICULOUS. That seems stupid to me. Wait, this is real? I though this was fake for some reason. I honestly can't see why anyone would get this. The only game this would be used for is Street Fighter, and anyone even remotely interested in that game probably already have it for consoles. Finally! Now I can play Galaga on my 3DS and not look like an idiot!!! Dude. That's a big stick. Blazblue CS2 on 3DS uses the D-pad exclusively for movement. Maybe if this is cheap I'll get it for that game. Even if the game allows you to control it through the D-pad, no one who knows what they are doing will use this, because the "D" in D-pad means digital! Smash Bros. relies heavily on having an analogue method of control for general movement and attacks. $18? That's cheap, I can afford two of those! @gamerphil07 Sorry. But it still IS digital!